Harlequin is pleased to offer Canada's best selection of formal kilt rentals. Great for Scottish weddings, St Andrews Day, Robbie Burns celebrations, Haggis consumption, Graduations, costume use, or any other special event that has a Scottish theme. Our authentic wool tartan kilt rentals are sure to fit! Available for shipping across Canada. Each tartan we carry is available in a number of sizes, however until we receive accurate measurements we cannot confirm that the sizes you need are available for your day. In some cases if another group has reserved the same tartan for the same date some sizes may be unavailable, so book at least three months ahead to avoid disappointment. 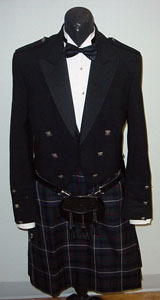 Kilt Rental packages include Prince Charlie coat, choice of Tartan Kilt with matching sock flashes, dark sox, leather sporran in black or brown, formal shirt (wing or lay down collar) with studs and cufflinks, and black bowtie. Rental sox available in black, navy, green, grey or brown. Off white available for sale, please contact us for more information. Call 1-800-823-6706 or email to reserve. Every rental requires a credit card guarantee to assure return of rentals on time and in good condition. A minimum $50 deposit is required to reserve your kilt. This $50 goes toward the total price of rental and is non-refundable in case of cancellation. In addition to our basic package we have a number of extra accessories. For weddings the groom will often add something to set himself off from the other men. Shoulder plaids to match most kilts are available in mens and smaller ladies (Bride) sizes. Traditional scottish hats (Glengarry or Balmoral) are available. Fancy sporrans in racoon or rabbit fur. Also available are casual kilt packages, which include the Jacobite (large sleeved pirate style) shirt in off white with a lace up front, choice of kilt tartan, (Brown Stewart is shown in Photo) leather sporran in black or brown, dark socks and matching tartan flashes. Add a shoulder plaid to complete this less formal look. Please have your measurements taken by a professional, and send them to us via email, or fax to 204-943-7013. Please include the name of your wedding party if applicable. Please see the videos embedded below for the correct method to measure for a kilt!